Chef Angelito Araneta, Jr. has been known for sprucing up everyday meals into memorable and extravagant masterpieces that are used in courtship and marriage proposals. The chef is making headlines for creating a one of a kind sushi dish. 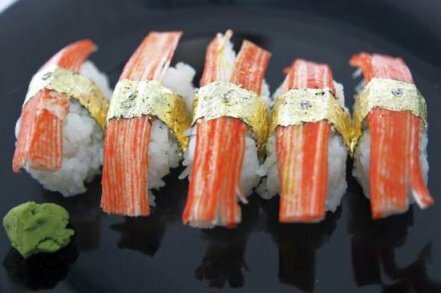 The elegant dish is complied of five pieces of sushi covered with a leaf of edible gold and garnished with a .2-carat African diamond. The sushi meal was presented at a Milanan restaurant in June and is valued at 91,800 pesos ($2,000 USD).